Middle schoolers Tula Webber (left), Clara DePaolo and Abby Baker prepare speeches for their March 14 walkout honoring the Florida school-shooting victims. After a week of TV interviews and public feuds with school administrators over a scheduled walkout honoring school-shooting victims, three Sacajawea Middle School students gather on a Saturday afternoon in a living room and make their final plans. 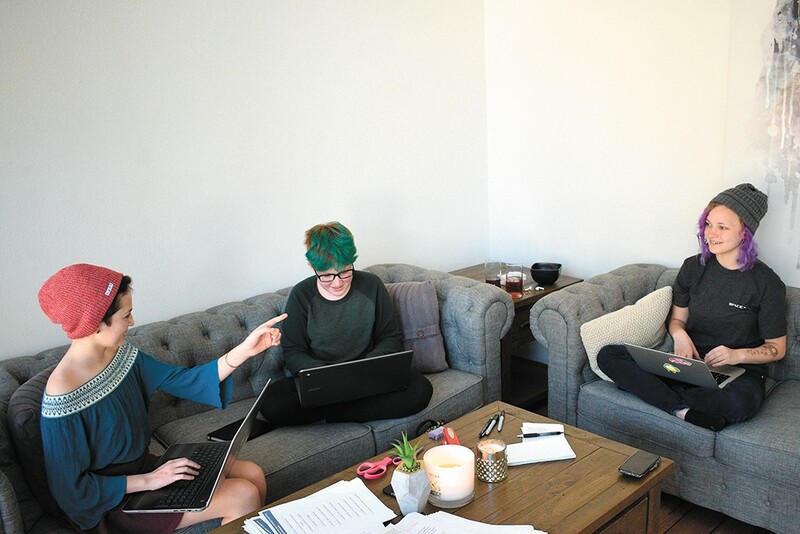 They sit with their feet up on the couch, looking down at their laptops and workshop the speeches they've prepared for the walkout on March 14. Pink scissors, markers and packets of paper lay scattered on the coffee table surrounding Abby Baker's cat, Cucumber. Next to Baker, the only eighth-grader of the middle school trio, there's a stray piece of paper with Sacajawea's rules for unexcused absences. Written in pen at the bottom of the paper is their simple strategy for overcoming any discipline the school might hand out for the walkout: "Overload the system." "We've had a few sleepless nights, working on printing stuff and deciding what our next move is," says Baker, 13. Baker, Tula Webber and Clara DePaolo have been organizing the walkout for weeks. They want to remember the 17 victims of the Marjory Stoneman Douglas High School shooting in Florida while calling for an end to the constant school shootings. And they want to share the message in their own way, not anyone else's, especially not the school's. "They say children are too young to understand," says DePaolo, who is 12. "But we're the ones who are being directly affected by this. We're the ones who could be conceivably killed in schools." They joined students all over the Spokane region and the United States in planning one of a series of demonstrations this spring, calling for gun-safety measures and an end to school shootings. After the March 14 walkout, on March 24, area students will lead a "March for Our Lives." And on April 20, students will again walk out of class on the anniversary of the Columbine High School shooting. The recent surge in activism is new to many schools, which must balance the right to protest with a desire not to disrupt the school. But these students are OK with rocking the boat a little. "This is going to be kind of a disruption," DePaolo says. "That's what it has come to with these school shootings every other week." Ellary Lockwood, a junior at Lewis and Clark, leads a protest-planning meeting last weekend. Four days before the actual walkout, Baker takes a breath as she prepares to recite her speech. "I don't have a fancy intro like you guys," she tells Webber and DePaolo. She recounts her experience with school shootings, an experience similar to just about any other kid her age in the United States. There's the confusion she felt when she heard about Sandy Hook in the third grade. There's the routine of constant drills preparing for a tragedy. There's the fear when her school went into lockdown after a shooting nearby at Freeman High School. There's the anger and frustration when she heard that 17 people were killed at a high school in Parkland, Florida, then the inspiration when the survivors demanded action. "This is our generation's reality," Baker says. "If you do nothing for us, we will do it for ourselves." She imagines a movement where gun laws are changed, where another school shooting is not tolerated. She throws in a line about wanting more from adults than thoughts and prayers, more from schools than "holding assemblies." It's a reference to the school-wide assembly that Sacajawea scheduled for the same time as the March 14 walkout, an effort by the school to provide a school-sanctioned platform for students to share their thoughts instead of students leaving school for the walkout. "A little shady," DePaolo tells Baker about the "holding assemblies" comment. "I love it." Schools varied widely in how they handled the 17-minute walkout. Students have a constitutional right to peacefully protest, but schools do have some discretion to discipline for absences or school disruptions. Sacajawea's handling of the walkout was not punitive like other U.S. schools that threatened students with suspensions. Spokane Public Schools, says spokesman Kevin Morrison, took an unwavering approach, treating it just like any other absence. In high school, students were "unexcused" if they participated without parents calling the schools to give their approval. At the K-8 level, adults were told they must come to the school in person to excuse the absence. Students can be disciplined for unexcused absences depending on how many they've had. Morrison says there's been no discussion within the district about changing the rules for walkouts or demonstrations. "Because at what point do we start making exceptions?" Morrison says. "What we have to do is weigh what is best for all families. And that's why you come up with policies and procedures that are fair to absolutely everyone and follow them." Coeur d'Alene Public Schools, by contrast, cleared hurdles for students who wanted to participate in the walkout. The district superintendent, Stan Olson, sent a message to families beforehand assuring them that students would not be disciplined for a peaceful protest. As districts prepared for the demonstrations, so too did the students. Like others, the Sacajawea students got the word out by making an Instagram page. They printed posters, flyers and permission slips to hand out so students could easily participate. They were frustrated when their principal scheduled an assembly for the same time as the walkout because they felt nobody would to listen to a school-sanctioned assembly. When they're together, they mock the inspirational videos they're shown in school. They say they're always told in middle school to "think outside the box," and that "the sky is the limit." But once they actually tried to do that, Webber says, they were shut down. "If a student's like, 'I want help writing a letter to SeaWorld,' they're like, 'Oh, great!'" Webber says. "And then we say we want to do a walkout because we don't want any more school shootings, and they're like, 'No, what do you think this is? Children aren't old enough to handle these issues.'" They're mature enough to know people have different opinions. They just giggle at the comments on news stories about them where people say they're just trying to skip school. They're all on honor roll, after all. The controversy with the school doesn't quiet them, but only makes them more defiant. They eventually scoff that the penalty for one unexcused absence is a trip to the counselor. "If they're going to send 50 to 100 kids to the counselor," Webber says, "have fun." They're following the lead of the Parkland students. Students in high schools all over the region — Lewis and Clark, Mead, Coeur d'Alene, just to name a few — latched on to the movement and planned their own walkouts. Fiona Whitver, the student who organized the walkout at Lewis and Clark High School, says she thinks students are rising up now because they've finally just had enough of the school shootings. "I think we have hit our limit," Whitver says. The student activism against school shootings in Spokane won't end with one walkout. In a labor union building north of downtown, around a dozen students from high schools in Spokane meet to organize the "March for Our Lives" that will take them through the streets of Spokane on March 24. The high school students — from Shadle Park, Gonzaga Prep, Ferris, North Central and University — sit in a semicircle, flanked by a few members of local activist organizations like Fuse Washington. The adult activists have buoyed the students' cause, helping with logistics like planning a route through the city and notifying police. But it's Ellary Lockwood, a junior at Lewis and Clark, leading the meeting with a giant note pad. Soon after Parkland, she realized a student needed to step up and take charge of Spokane's march, one of hundreds worldwide to end gun violence and mass shootings in schools. "I thought March For Our Lives would just kind of happen. I hadn't thought about organizing it because usually marches are things you show up to and don't give a thought to how they happen," Lockwood tells the Inlander. "I thought, since we needed students organizing this, I can be one of those students." The issue may fade away from the minds of adults in the aftermath of a shooting, but not from students, Lockwood says. She always hears about threats to local schools, or about kids caught bringing a gun to school. Tragedies like the Florida shooting or Sandy Hook remind her how devastating it can be, and the shooting last year at Freeman reminds her it can happen here, too. 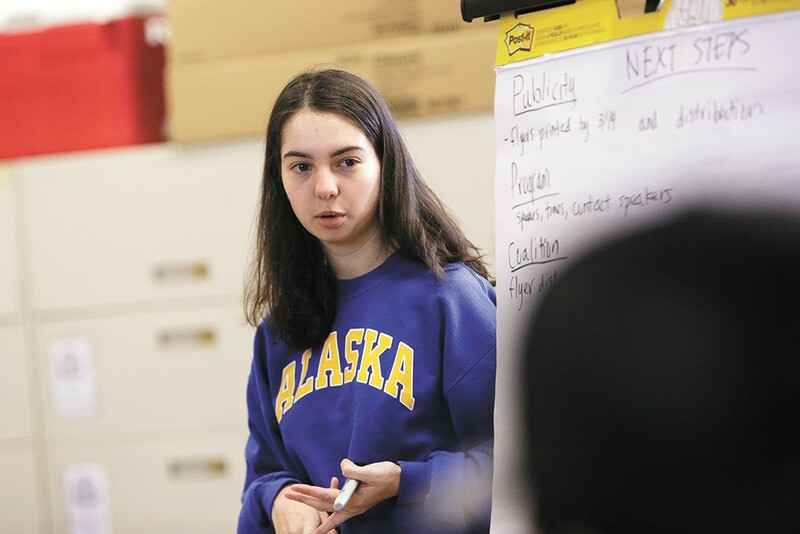 Another Lewis and Clark junior, Caroline Slater, is planning a walkout called No Kids Left Spokane on April 20, the anniversary of the Columbine shooting, for similar reasons. In between taking SATs and her regular school work, she launched a social media campaign for the walkout advocating for more background and mental health checks along with stricter laws on the sale of assault weapons. She knows not everyone, even students at her own school, agrees on what can change it. But when she saw the Parkland students on the news running out of the school, it hit home. It reminded her of her high school, where she feels there's little stopping the same thing from happening. So she decided to join the national push. The original print version of this article was headlined "The Disruptors"